The Governors have tonight unanimously decided, after a long and exhaustive consultation process, that Hove Park School will not convert to an academy. We want to thank the students, parents and carers for their passionate contribution to this debate. We also want to thank the staff and senior team for their professionalism and dedication to the school throughout this consultation. Hove Park is a dynamic and improving school. We are excited about its future and we want to build on the community engagement that we have inspired during the consultation. 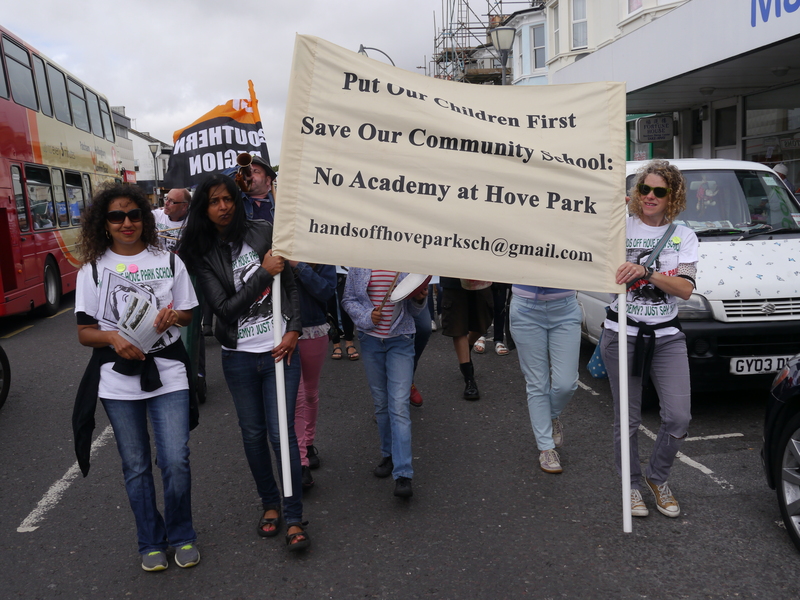 “The parents, carers and members of the community that make up Hands Off Hove Park School are delighted and thrilled that the governors have ultimately made the right decision and voted no to academy status. This is an excellent result for the whole of this school community but also for all schools across Brighton & Hove. Mr Trimmer and the Governing Body have clearly recognised that the reality of academies is that they weaken governance and accountability and offer nothing in terms of raising standards or improving the educational environment for children, parents, teachers and communities. When the proposal to become an academy was first made in March a lot of people thought it was a done deal. We have to thank all the students, parents, teachers, city council, trade unions and other community members that kept faith with our campaign. Together we have made banners, written letters, composed songs, tweeted, posted, marched, rallied, lobbied, laughed, performed, donated, banged wheelie bins and stood at the school gates night after night to ensure this conversion didn’t take place.At times it has taken over our lives but it has brought us together as a loud and strong collective voice. It has demonstrated that Hove Park has a fantastic community who clearly care about the school and the education of all children in the community, regardless of background or ability. We hope other parents across the country involved in similar battles against the deregulation of state education will draw encouragement and hope from our campaign. We hope that people will take similar action where the public services they cherish and depend on are threatened. It’s been hard work but it’s been a lot of fun. As we are sure you are all too aware, a major decision on the future of Hove Park School is in your hands tomorrow (22/9/14). As a group of parents, carers, grandparents, students and other community members, we trust you, as our representatives, to reach the best decision for the school. We hope you will acknowledge the strength of feeling in the community you are serving, which can be measured in terms of the results of the parent ballot and recent governor elections. We hope you recognise that if this energy is embraced, it can be used positively for the good of the whole school. Alternatively, a vote for academy status will be opening the door to further disruption of Hove Park students’ education and more disaffection amongst parents, teachers and students, who will quite rightly feel that they have not been listened to. The unions for teaching and non-teaching staff have already indicated that further strikes are likely and parents will carry on their campaign, which is now attracting national press interest with broadsheet coverage likely. We understand that a number of good teachers have already left the school because they don’t want to work in an academy and we understand that some new-intake parents have already opted for schools that are not seeking conversion and not enrolled their children at HPS as a result. Clearly the impact of this uncertainty is already making its mark on the school. We trust that you, like us, have done your homework on what academy conversion would mean for students, teachers and the community both now and in the long term – because as legislation stands, this is an irreversible decision. We also trust that you, like us, have watched closely as individual case studies across the country begin to feed into an emerging national picture of how deregulation of state schools is impacting directly on communities. Government policy on this will inevitably continue to shift as we move towards the 2015 General Election over the next few months. We very much hope that like us you have reached the conclusion that there is neither a financial nor educational imperative for conversion to academy status. It is neither the best option for this school nor the chosen option of the people that matter – the students, teachers and parents/carers. A ‘no’ vote for academy status will demonstrate that the governing body listens to and cares about the views of people in the school community. It will win over huge support and that can only be in the best interest of us all. Brighton & Hove Independent says Hands Off Hove Park School! Check out the great coverage in today’s Brighton & Hove Indy, including front page headline, Mark Steel comment and the Independent view of the editor…. Join our campaign and help lobby Hove Park School governors to drop the academy plan. One meeting takes place on Monday 15th September, with the final decision on the academy expected on Monday 22nd September. Please meet at the school gates with banners, badges, but mainly yourselves – Nevill Campus, Nevill Road – 5.45pm – and LET’S MAKE SOME NOISE!